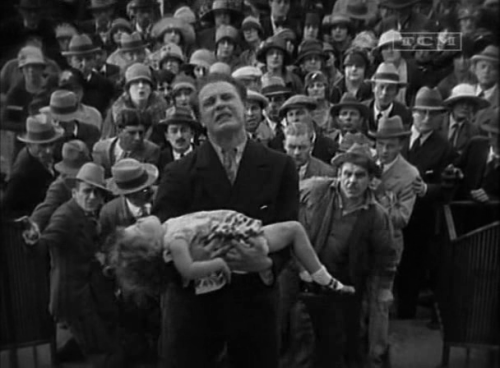 King Vidor’s 1928 exploration of the common man, The Crowd, proves an interesting contrast to most cinema of its time. Rather than continuing in the tradition of sharing yet another successful Cinderella-story of an individual rising above the crowd, it elected to turn that ideology on it’s head and deal with the reality that “the crowd” is simply a massive conglomeration of individuals all playing the game of trying to rise above “the crowd.” Inevitably in such a system most of them fail, and Vidor elected to explore that majority rather than the successful few whose stories seem designed to keep the masses motivated to play the game. In the film, John Sims’ life and personality begin with ardent idealism. His late father expected great things from him, and all his bright-eyed self wants is “an opportunity.” An opportunity to do what exactly? Not to become a ubiquitous part of the crowds of New York City, but rather to somehow rise above the crowds and become “somebody special.” Because in the Capitalist consumerist society that Vidor explores, the two are considered mutually exclusive. But John never actually gets “an opportunity.” Every semblance of good fortune or talent that befalls him is immediately followed by greater tragedy. Sims is a dreamer, but one without the talent or breaks needed to get ahead. And that’s Vidor’s point: that ambition alone doesn’t cut it. John Sims represents people who have ambition, but less luck, talent, or connections; those who never make it. As John Sims accumulates these experiences, they change and shape his ideology and perception of reality. Marx insisted this is how men’s perception of reality is formed,  that “the nature of individuals depends on material conditions determining their production.” Meaning that the economic system and pressures that an individual experienced would be the primary factor in determining their belief system and world view. The Crowd remains an unusual Hollywood film for its unglamorous portrayal of everyday life. It incorporated some [German] expressionistic style, but it also crafted a realism not familiar to American Cinema. The first appearance of a toilet in an American narrative film, shown as evidence of John and Mary’s cramped Murphy apartment, was rather scandalous. The film persisted in a slow, deliberate downward spiral, showing increased weakness, cynicism and dysfunction in the profoundly human protagonist. Despite John’s initial self-evaluation that he is something special, the film makes repeated vignettes showing that John and Mary Sims, and their family’s story is only one uniform portion of a much larger “crowd” of individuals. The film actually opens with the first instance, the crowd passing the Sims’ home on the day John was born, oblivious to what is going on inside. The second instance is shortly thereafter, when a crowd forms upon the arrival of an ambulance at the Sims home, and John is called forth from the crowd and informed of his father’s fate. The film continues to place John within crowds in distinct and artistic shots throughout the film. The shot establishing John at his desk in his office is legendary, and comparable establishing shots involving a moving camera are used to show Mary in the maternity ward, and the Sims family on the beach. Vidor said of that sequence, “I wanted to pick out one floor of a tall building, and one office, one window, and one desk and one man. But how do you go up to the 22nd floor, in those days before zoom lenses and before booms? We built the building lying down on the stage, and then with a bridgework for the perambulator, [the] camera could go up the building, and then when we tilted it down to that floor, we zoomed close to the window. We then went to a shot that was shot on a big empty stage with 200 desks, and 200 men sitting at the desks. Then [using an overhead rigging originally intended for lighting] we tracked across the room and settled on one man. “ The artistic triumph of the film is the perspective afforded by such pioneering shots. Vidor cast an unknown actor, a movie extra, James Murray, as John Sims. The symbolism of this decision is apparent and appropriate, as casting one of the minority who have already succeeded to play the guy who never does succeed within the Capitalist system would create a narrative with excess baggage and a conflict of interest. Though Vidor could not have predicted how prophetic this role would be. Vidor’s wife, Eleanor Boardman, was cast as John’s wife, Mary Sims. In the scenes depicting their courtship, they are both clearly sold on the competitive nature of Capitalism. They are both “snobs” regarding the crowd. They each see themselves as superior in potential to the swarms of other human beings around them (many of whom show signs of being resigned to their fate.) These two characters are both too traditional to thoroughly embrace the new morality of the 20’s (John “needs to study” and Mary has faked a bob-haircut), and the title cards depicting their conversation on their date are utterly unimpressive. They are neither of them especially witty or bright. Yet the sincerity of their expression is remarkable, and the scene abstains from being parodical. Vidor’s ability to walk that line, to point out folly without guile, is key to the tone of this film. He creates a protagonist who is at once absolutely typical and utterly convinced of his own atypicality (which, according to the underlying momentum of the film, is what makes him absolutely typical). John Sims is both victim and beneficiary of the American Dream. 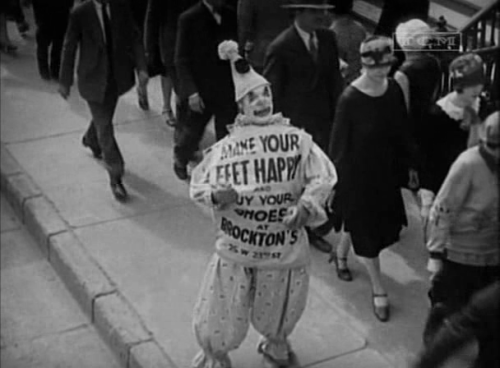 The film consistently puts Sims’ character in his place – by portraying this idea that John Sims’ belief in his own “atypicality” was what “made him typical” – just another face in the crowd. This is most poigniantly illustrated by the contrast between John's contempt of the man juggling on the street, dressed as a clown. As he spots the man, his title card reads, "I bet his father thought he would be President," which is clearly reminiscent of the expectations we saw John's own father express for him. It becomes a natural arc of maturation and acceptance when John finds himself in those very shoes toward the end of the film. The oppression of the metropolitan crowd toward John’s character begins as soon as the first scene showing John working at his desk. The dominance of intellectualism and reckoning in a city environment, as described by Simmel, becomes an overbearing force of nature as the film progresses. The more John insists on the atypicality of himself and his family, the more “the crowd”, which he sees as the “other” seems to tyrannize him. The secret to the film, however, is that the crowd is not the other. John is a typical member of that crowd, as consistent sweeping, zooming, panning stylized shots remind us. From his birth, John Sims IS a member of the crowd. That is to say, he’s a participant in the society(and it's ideology and economic system)that he’s born into. It’s in thinking that he is above the crowd that John manifests the particular mass-mind that Vidor disects. That “mass-mind” is notably similar to the cosmopolitan tendencies toward antipathy and a blasé attitude that were described by Simmel as the result of sensory overstimulation in urban environments. 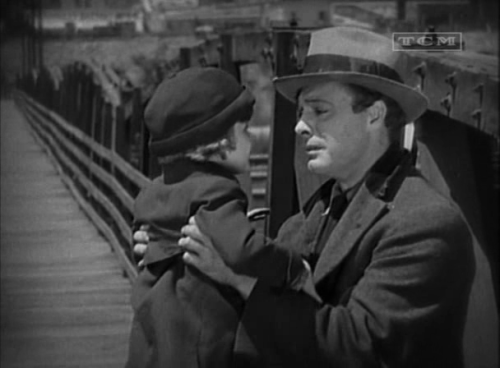 John clearly exhibits these traits himself early in the film, (especially on the bus home from Coney Island), but as the film progresses these traits in the crowd around him, and his own inability to maintain them in his grief and struggles, put him irreconcilably out-of-step with the crowd. John then goes from perceiving himself as atypical from the crowd in a desirable way, to perceiving himself as atypical from the crowd in an undesirable way. In the tragic scene at the heart of the film, where John's daughter is hit by a car John realizes, just how relentlessly kinetic the crowd can be. The crowd that witnesses the accident is affected by the tragedy, but as a policeman later tells John “the world can’t stop because your baby is sick.” The crowd moves along with its bustle even before the little girl draws her last breath. John is powerless to stop them. The death of John’s daughter turns his already tentative ability to function within the competitive parameters of the Capitalistic metropolis on its ear. There is no room in that rat race for his despair, and John’s grieving is seen as outside the acceptable norm. 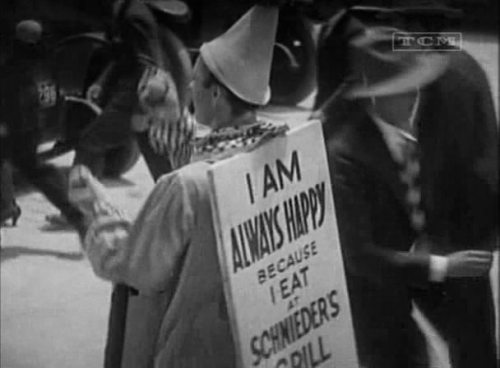 The intertitle describes this incongruity, “The crowd laughs with you always… but it will cry with you for only a day.” As John’s grief obliterates his ability to function within professional confines he was already struggling with, the intertitles continue: "We do not know how big the crowd is, and what opposition it is...until we get out of step with it." Marx proposed that “All change results from the constant conflicts arising from oppositions inherent in ideas, movement, and events.” Certainly the change in John Sims comes about because of the oppositions inhererent in the Capitalistic American Dream. If everybody is somebody special, then nobody is. As John begins to grasp his own utter replaceability, and his true place as a typical face in “the crowd,” he is first desperately depressed (suicidal), and finally consigned. Vidor worked consistently against the “nagging wife” stereotype by showing Mary’s character to be much more adaptable and able to mature, even as she dealt with John’s nagging, narcissism, and self-doubt. John’s character fleshes out the need that Simmel described in metropolitan dwellers to stress the particularity, incomparability, and unique identity of their individual selves. As his ability to perceive himself as needed or irreplaceable evaporates, he is driven to desperate depression. Vidor very carefully did not save John’s character from suicide by showing him that he was needed, only that he was wanted, and liked (by his son, and ultimately by his wife). The crux of the film lies in John Sims deciding that this is enough. That his small, typical, pedantic life is worth living. Ultimately John finds solace in becoming a member of the crowd, rather than trying to rise above it(or to the top of it). He willingly becomes the very thing he shunned earlier in the film, a poor sap in the crowd, a juggling clown. 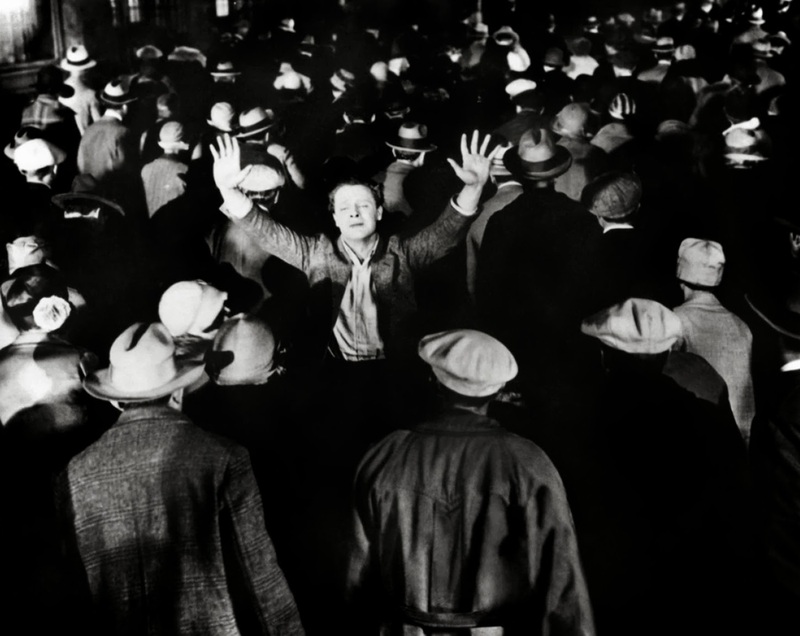 The ominous final shot, illustrating John Sim’s content resignation to his place as just one typical story among countless others, was foreboding of the stock market crash that came the following year in October 1929. As the Great Depression descended, surely countless people found themselves living John Sims’ tragedy. Unfortunately, one of them was James Murray, the actor who had played John Sims. Georg Simmel, “The Metropolis and Mental Life” 1903.